Prepare and freeze the potatoes in advance. Cook from frozen for gorgeous crispy edges and soft centres. Goose fat is the secret ingredient for success here. 2 Drain and toss each in a colander to rough up the potato edges. 3 Spread out the potatoes onto 2 baking trays. Cool, cover with cling film and freeze. 4 Heat the oven to 200C, Gas 6. Put the goose fat into a large roasting tin, heat for 4 mins, till sizzling. Add the frozen potatoes and shallots and cook for 30 mins, turn. 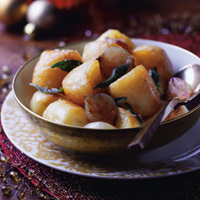 Sprinkle with salt and sage and cook for 30 minutes more until crisp and golden, turning as needed.